Turn Your Outdated Bathroom To Green! With a few easy steps and updates, you can turn your old and outdated bathroom into a new and environmentally green one. There are many ideas and products you can add to your bathroom to make it an Eco-Friendly part of your home. In return, you will dramatically reduce water, reduce the chance of mold and mildew, and do your part in preserving our environment. 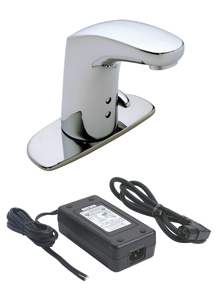 Toilet: Using a two level flush systems can assist with reducing water wastage. 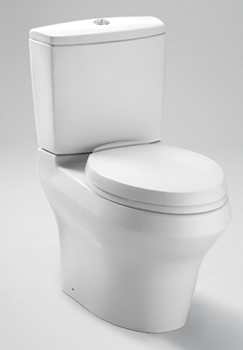 The dual flush uses one for liquid waste, by using less than a gallon, and one for the solid waste. By installing and using a high efficiency toilet, you can save you an average of $100 a year, which is about $2000 over the lifetime of the toilet. Some city municipalities offer incentives to home owners who purchase high efficiency toilets. They can range anywhere from $25 to $175. By changing your water- devouring toilet to a high efficiency toilet, it can save you money and reduce the usage of water for the environment. Showerheads: With constant droughts, reducing water is a must. A typical shower consumes up to 25 gallons of water, while each household uses an average of 100 gallons of water a day total. By changing your showerhead to a low-flow fixture, you will reduce the amount of water you use, but not the pressure. Low flow showerheads offer many unique features such as flow adjusting dials and pause buttons. Faucets: Federal law requires new faucets not to exceed 2.2 gallons per minute (gpm). However, older faucets can flow at rates as high as 3 to 7 gpm. Changing your outdated faucets to a better performing, and water-efficient fixtures will help you save water, energy, and money while still receiving an adequate flow. By simply trading in your old faucets for a new energy preforming faucet, an average household can reduce its water consumption by 500 gallons each year. Using of sensor faucets are a great way for reducing water consumption in your household. This “hands-free” technology acts as a sensor to start the flow of water automatically and with ease. The sensors’ detects your presence, and robotically shuts off within seconds once you remove your hands. Tiles: Go green with your tiles. You can choose earthy cork, clean ceramic, or recycled glass tiles for your bathroom floor and walls. The use of heavy-duty marble for your baseboard will give your bathroom a sturdy but eco-friendly finish. When sealing your tiles be sure to use nontoxic grout and grout sealer. Ventilation: Restoring the bathroom’s ventilation can hinder mold and mildew development. Start with installing a noiseless fan that is fitting for your bathroom size, and vent it to the outside. Consider more than one fan if the bathroom is large. Most updated bathroom fans have timers or humidity-sensing switches to guarantee that the fan runs long enough after a bath or shower. Water Heaters: If a water heater needs substituting, pick a high-efficiency type and consider a tankless heater or a hot-water circulation option if the main water heater is not directly near your bathroom. The fundamentals of turning your bathroom eco-friendly managing water flow and choosing long-lasting materials that are made to handle the wear and tear of a moist and highly usable area. In return, you will be doing your share in improving our environment while keeping some cash in your pocket.